In September, Sariev Contemporary's artist Kamen Stoyanov will be presented at the programme of viennacontemporary with his project Phantasy is more important. It will be presented by the former shipping container - transformed into a interdisciplinary open platform and stage FLUCA - Austrian Cultural Pavilion at Notgalerie, Vienna. For the Notgalerie, Kamen Stoyanov proposes the project Phantasy is more important. The Notgalerie was originally an “emergency” church build in 1946, because there were no other churches around. It became a permanent provesorium. In 2015, the building was moved and rebuild by Reinhold Zisser, who turned it into the Notgalerie (“emergency gallery”). It became a sculpture and an exhibition space at the same time. The Notgalerie is currently located in the developing area “Seestadt” next to the metro station with the same name. Leaving the metro, one is outside of the city: a potential place for construction but so far only empty suburban fields not in use. Kamen Stoyanov's project Phantasy is more important deals explicitly with visual uncommon houses and their surroundings. 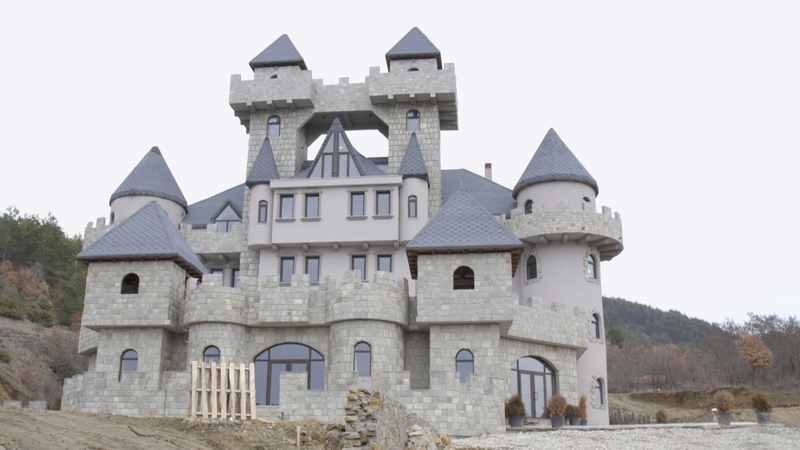 Stoyanov filmed three guest houses in the village Marchevo, Bulgaria, which are designed to be special in order to attract guests. There are not many people in Marchevo and also around the Notgalerie. The non-urban spaces of Marchevo and Seestadt connect through emptiness and wasteland. Public art was introduced in Seestadt to bring people in this area. Sometimes “art” is a good tool for attracting people to visit a place. The artist was also for the first time in Seestadt for visiting the Notgalerie. In a sense in Marchevo, Bulgaria, it is “popular” art introduced by the hostel owners to attract paying guests. Stoyanov problematizes not only the way, how popular “art” or visual attraction is used for commercial ventures, but also how art is becoming a tool for spectacle. In its extremes, this leads to Disneyfication of former public space, themed environments and highly commercialised space where people mostly have to pay to have access. For the artist, the Notgalerie as an artefact and exhibition place is convincing, because it is focusing on its simple and honest building structure. Stoyanov's video starts with a close up of a realistic figure of Albert Einstein looking out from a balcony. It should function as an attraction and advertising for the House&SPA Einstein. The silence of the figure introduces the stillness which Stoyanov keeps throughout the video. Like a cinematic still live composed by still sequences. Stoyanov portraits the houses and its surrounding. The culmination point of the film is a house, which first just appears not straight. Then, it slowly becomes visible, that the house was built upside down. The roof is on to the ground. Worldwide, there are quite a few houses built upside down, mostly functioning as touristic attraction for paying visitors. The house in Marchevo is the only one the artist has found so far which functions also as a hotel. For the project Stoyanov spent some nights there to produce a series of photographic images from the interior.